Mokulua Islands act as sentinnels, guarding the beach of Lanikai. 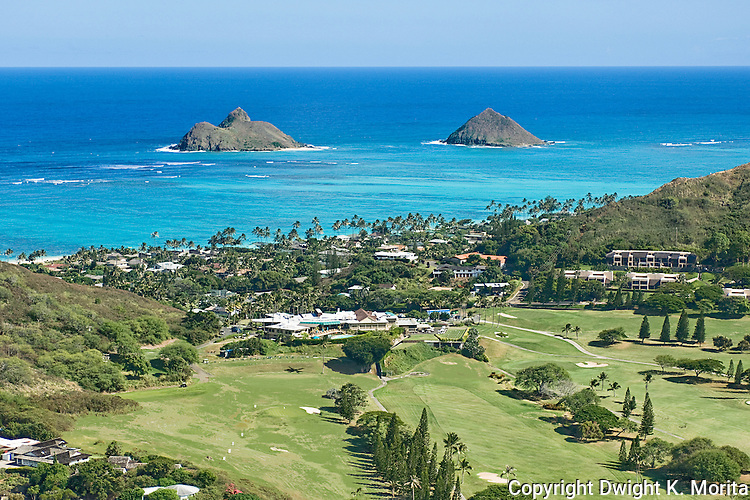 Mid-Pacific Country Club clubhouse and golf course is in the foreground. Bluestone condominium community on the right. A graduate of San Francisco Theological Seminary, Dwight K. Morita's ministry is at the intersection of spirituality and the photographic enterprise (taking photos, viewing photos, editing, etc.) Dwight served as photographer in residence at McCormick Theological Seminary in Chicago and he has won a number of awards and recognition for his images. Currently he is located on the island of O'ahu where he is engaged in ministry with Nu'uanu Congregational Church, The Institute for Human Services, Inc, Family Promise, Faith Action for Community Equity (FACE), and other non-profit organizations.